This was a band of considerable size. There were also important musical contributions from producer Jochen Pedersen, previously a member of the little known group Ikarus, who released an album for the Plus label. 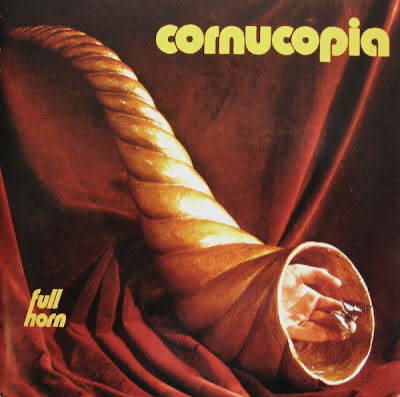 On Full Horn (1973), Cornucopia presented a weird and eccentric jazz-rock fusion that is so varied and continuously shifting that it is hard to describe the music. The same could be said of their label mates Thirsty Moon. The album started with a 20 minute suite called "Day Of A Daydream Believer". This one was an attempt to link very different pieces of music (and twisted weirdness). The result was erratic, but quite interesting and unusual. On the other end of the scale, "Morning Sun" (3:07) was a tuneful little pop rock song. The remaining two tracks fall between these extremes. All were written by the Cornucopia leader Cristoph Hardwig. The album is rare, but not very much in demand, and therefore still affordable. Notes: Album originally released in 1973 as Brain 1030. Recorded at Windrose-DuMont Time Studio, Hamburg - Sept. '72 & Febr. '73.